If you are or were a steak lover, and had already made the decision to eat out at a nice steakhouse, maybe for a special occasion—which of these would you pick? Or let’s say you’d already made the decision to buy a new flat-panel television, and had saved up enough to do it (so budget or saving money was no longer your driving motivator)—which of these would you pick? It turns out most people pick the middle choice for a very particular reason. It looks like the best choice relative to the other choices presented. The television example was based on one used by MIT Professor Dan Ariely in his book, Predictably Irrational. 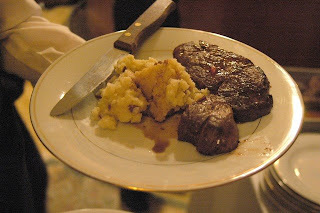 Ariely notes most people do not have such extensive knowledge and have not done such extensive research that they can readily compare a Panasonic to a Philips, at these different sizes (or by extension, distinguish the best value among different steaks (in this example, all being similar cuts)). So they compare among the choices presented, as best as they can. [M]ost people don’t know what they want unless they see it in context….We don’t know what kind of speaker system we like—until we hear a set of speakers that sounds better than the previous one… Everything is relative, and that’s the point. Like an airplane pilot landing in the dark, we want runway lights on either side of us, guiding us to the place where we can touch down our wheels. The center circles in each image are the same size—but the relative size of the circles around them make them appear to be different sizes. The same type of thing happens when we look through different models of a product at a store or read through a menu at a restaurant. And the stores and restaurants know this! Ariely has done experiments to confirm that the addition of a most-expensive option or even a decoy option that makes another particular option look more attractive consistently drives consumers toward a particular choice—the one that the store or restaurant is pushing! Do more thorough research (at least where the size of the purchase warrants it) so that you are better able to identify the best value. Understand and remember that the “most expensive” option may be presented simply to make other prices seem more reasonable. Understand and remember that there may be a decoy option presented that makes a similar-looking option seem better—but that it may distract from some other option that is really the best option. By the way, Ariely has a website, Predictably Irrational, in which he discusses and builds on the findings of his book—so check it out! In the steaks options the 16 oz is cheaper both complete and per oz so I chose that item. I also am not enough of a steak expert to konw enough of the difference so price was of greater importance. When I read the question for TVs I know that I would take a look at my space and use to choose a size, then do some research for which brand has better quality. I really enjoy these posts on marketing vs the consumer.